Growing up in our large city, one learns real fast how to navigate the city services as efficiently as possible. Today I use my 311 application to report graffiti, bulky items, and illegal dumping, and yet even with all these technical advances. There are still so many areas in our communities that fall in between the cracks where there is no apparent agency or person to keep them clean, let alone regularly maintained. Whenever driving, I am always asking myself what can we do as residents to improve the face of our communities? The thing that saddens my heart the most as a resident is when I see areas of our community overtaken by weeds combined with trash and debris. What’s even worse, is that this urban blight can remain there for days and even weeks. Reporting it to the city could take weeks. In the meantime I pass it every day and ask the same questions. It’s very easy to cast blame toward inadequate city resources, the apathy of not caring, the large entities which do business in our community but are not being responsible to maintain their outer premises but whatever the reason, the question still remains: how to get our communities cleaned? Here in our community we are fortunate that many residents take pride and make strong efforts to maintain their homes and community. 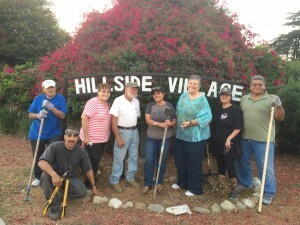 Our homeowner’s association has worked hard to schedule regular clean-ups for areas that are in need of some TLC and will often do quick hit clean-ups. Considering many of our volunteers are older, we do wonders. Most of our focus is primarily in our immediate community but we also frequent out to neighboring communities such as El Sereno, Lincoln Heights, and Boyle Heights as well. We’ve realized that very often, the most effective and direct answer is to just do it ourselves! Is it hard work? Sure! Is the labor few? Yes! Are there city agencies most likely getting payed to do these types of clean-ups? Probably. Does the cleaned area look beautiful once it’s done? Absolutely! The reality is that our city’s resources are very scarce and community clean-ups are a powerful way for residents to fill in the gaps of city services. They also serve as an inspiration to others that residents from our community are taking the time and effort to improve it. At times it feels overwhelming but then I remind myself of the story of the Starfish in the Ocean. As one astute beach comber was asked why he bothered throwing starfish back into the ocean as they washed ashore by the thousands? What difference could that make he was asked? “Well, he replied, it made a difference to that one” referring to the starfish which he had just thrown back into the ocean. That is the way we must also see it as residents. It may seem like a small act of participating in community clean ups, or reporting graffiti, or even keeping the front of one’s residence maintained but these small acts make a tremendous difference. These are our communities and we as residents have the power to make them into strong communities or allow the weeds to overtake them. Please help make our communities safe, clean, and strong, one starfish at a time.